Dual front V brakes operated from a single lever. We have even been cycle camping on Mikado, using front and rear panniers, plus a BOB YAK which we call Yasmine. See photo from our Quorn trip last year in the photo review of 2003. We took two tents (Hilleberg Stalon GT and Nallo 2), plus 3 collapsible chairs!. 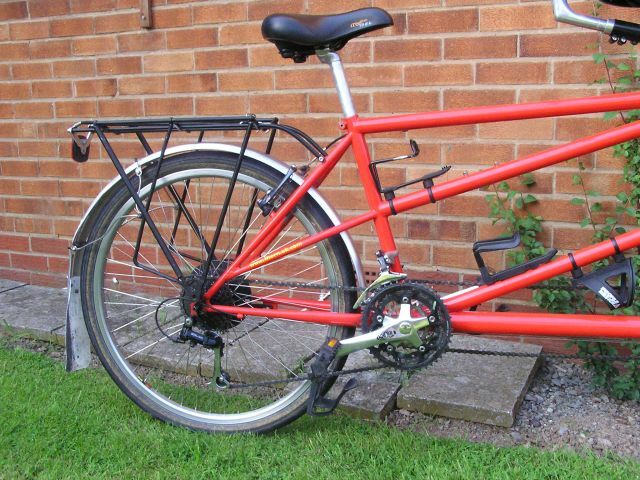 In order to carry Mikado we firstly modified a Pendle front wheel out tandem carrier, but found that had limitations so we designed and built our own see our carrier page. 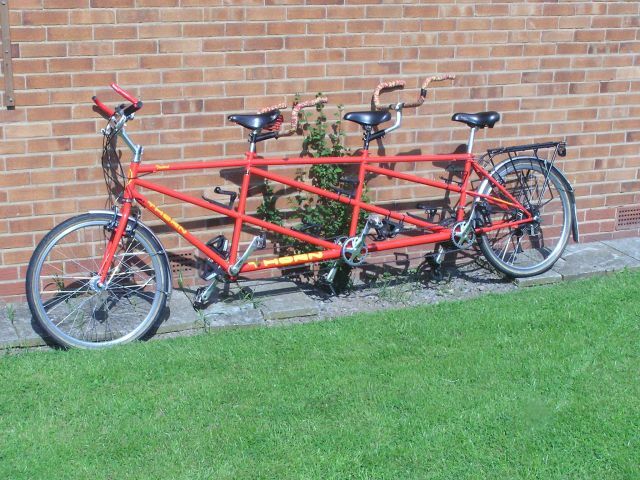 See the St John Street Cycles website for more background details on Thorn range of cycles. Suntour XC Comp front changer controlled from Suntour power shifter. 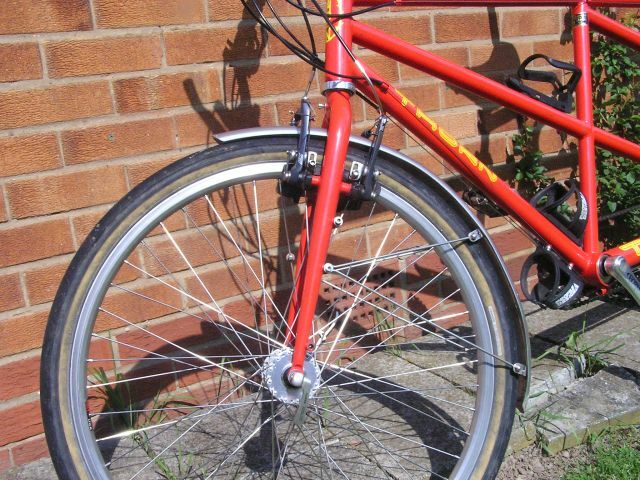 Rear: Shimano LX V brake and Aria drum brake with quick release, controlled from a Suntour power shift lever, located under front gear changer. Wheels Shimano XT tandem hubs with Sun Rhyno rims, 48 spokes, fitted with Panaracer Hi-Road S, 26 x 1.75 (note these tyres do not show the correct ISO designation of tyre size). Mikado, our triplet. A Thorn Trident of June 2000 vintage. She is 22/20/17 inch (44/51/57 cm) frame size. View from the front and rear ends. 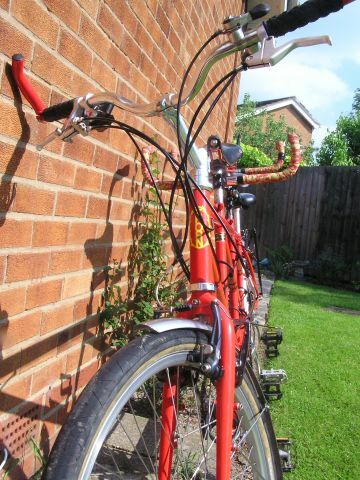 Note the Rough Stuff Fellowship sticker on the rear mudguard. Mikado has done a few gentle tracks. 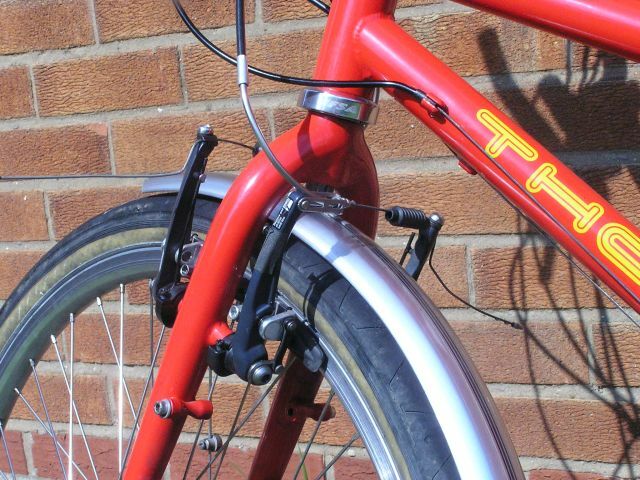 Dual front brakes, with separate cables from the single lever. Front forks showing brakes, and braze on for front carrier. 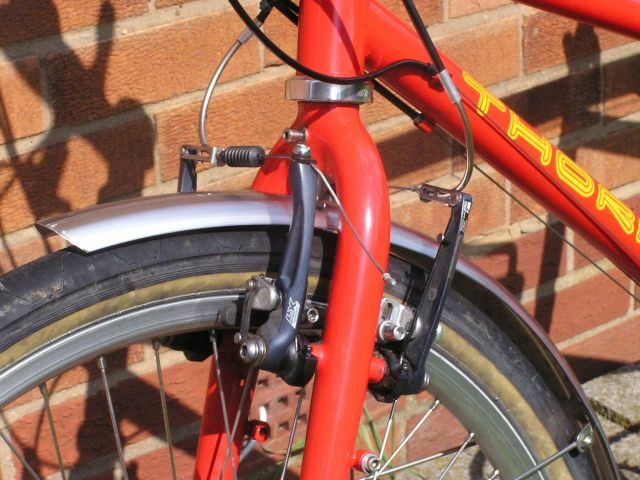 Dual front brakes, with separate cables from the single lever. 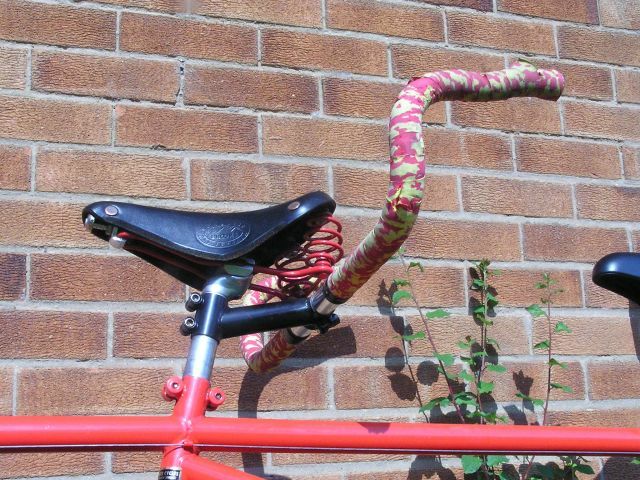 Front handlebars with extensions added. The lower lever on the left is to control the Arai hub brake. 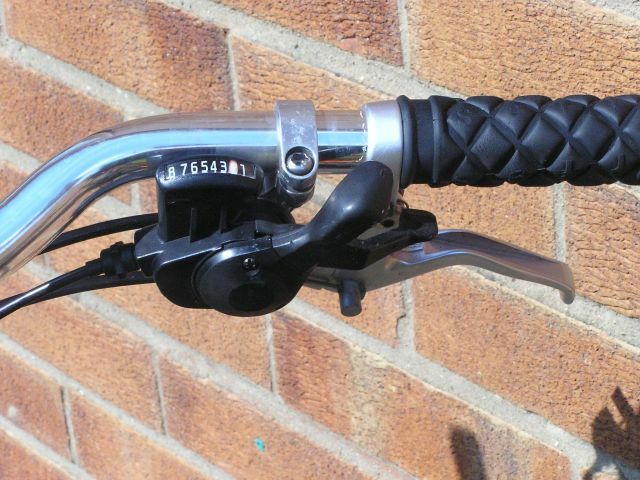 Detail of the dual brake lever conversion from a single lever. 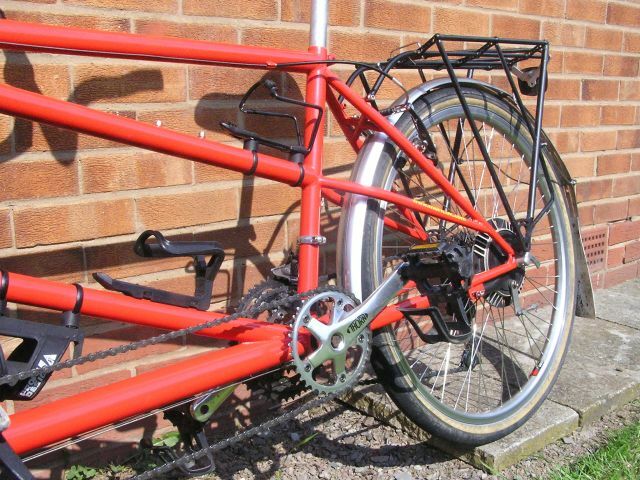 this has the advantage that both brake cables can be adjusted separately. 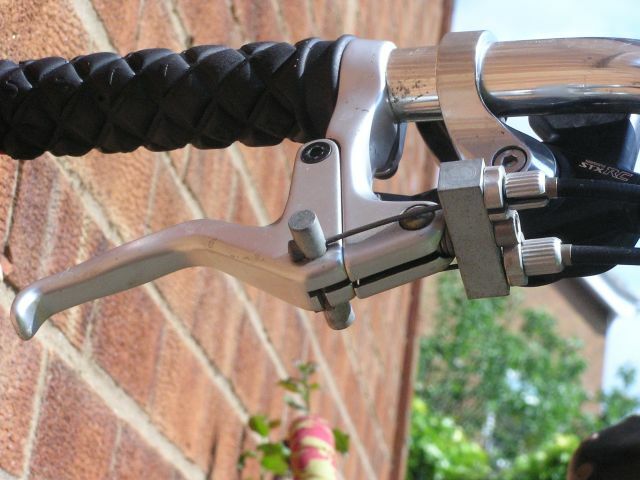 The Shimano STX RC rear gear changer. 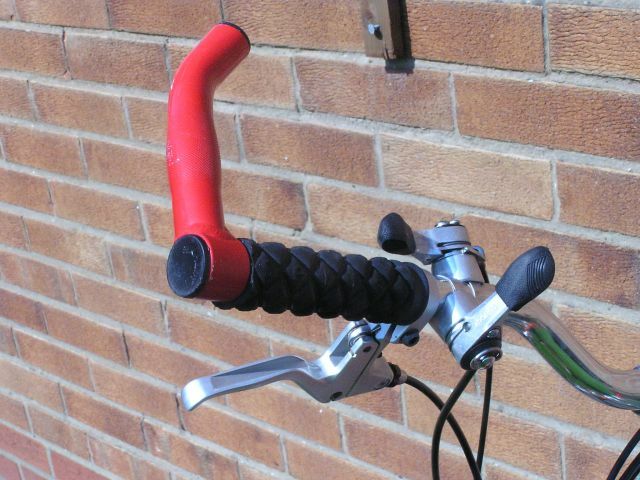 Left side of the handlebar showing the brake lever with the two Suntour power shifters. The upper one is the front gear changer and the lower one is the Arai brake lever. Rear end view showing SJS Thorn expedition rack, mudguard, V brake and Arai drum brake. 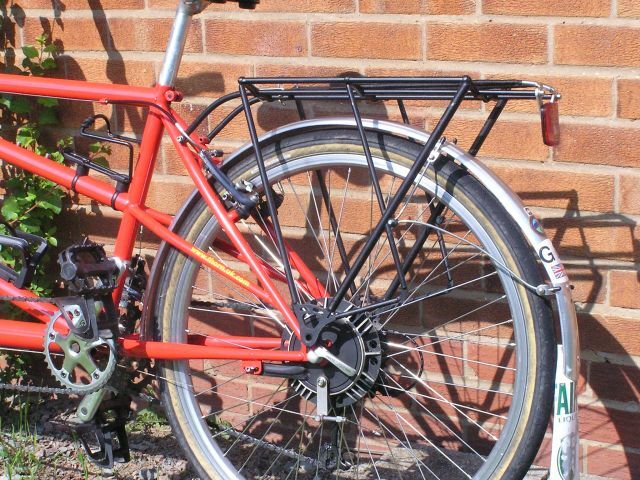 Rear end view showing SJS Thorn expedition rack, mudguard, V brake and Shimano LX rear changer and chain rings. 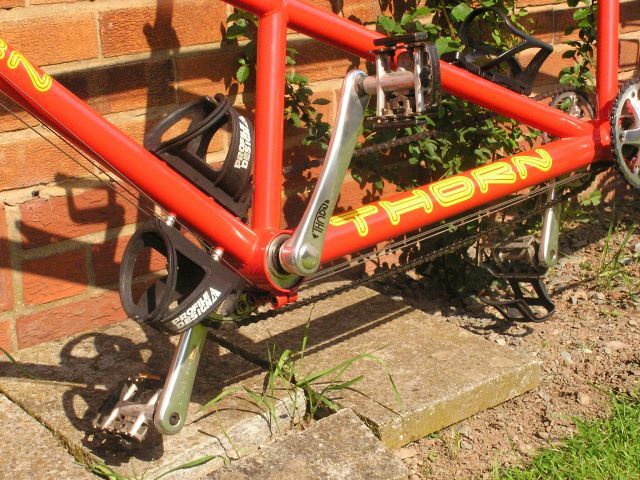 The rear Thorn cranks are 155mm long. 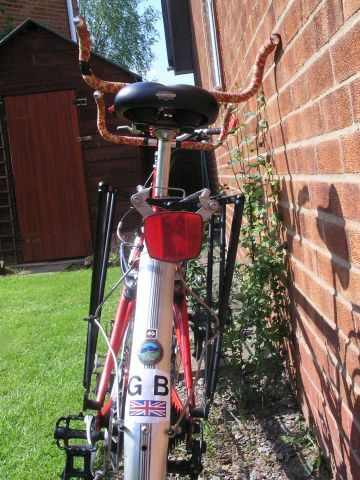 Rear end view showing SJS Thorn expedition rack, mudguard, V brake and Arai drum brake. Note the "X" bridge. 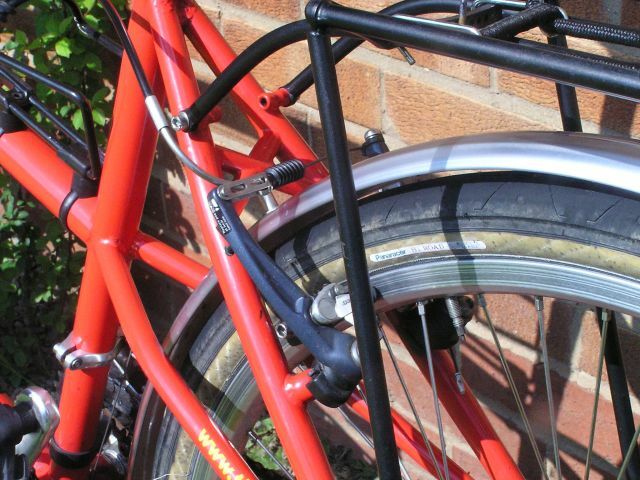 Rear end detail showing rack fitting and "X" bridge with mudguard fixed to the bridge. 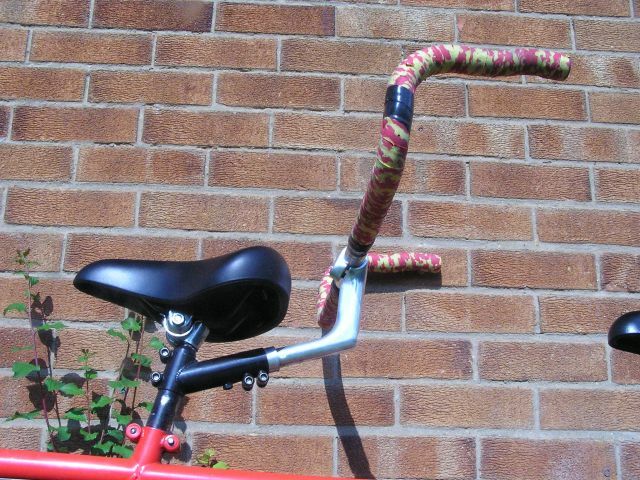 Middle handlebars with fixed length stem and SJS stoker bars. Front Brookes leather Conquest saddle. Note matching red springs. 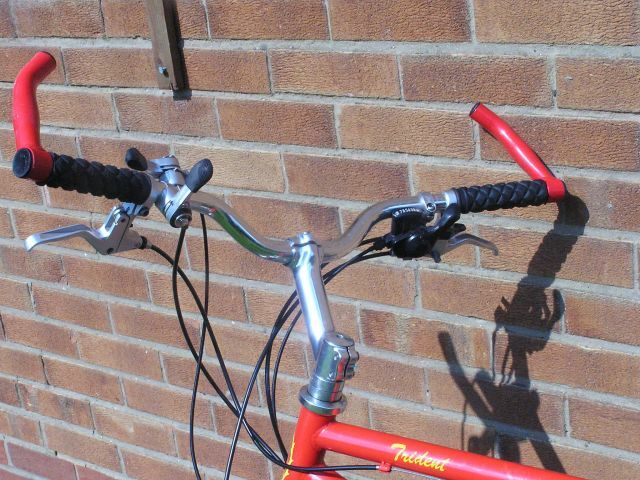 Rear handlebars with adjustable length stem and SJS stoker bars. The saddle is a SelleRoyal Soft Ride. 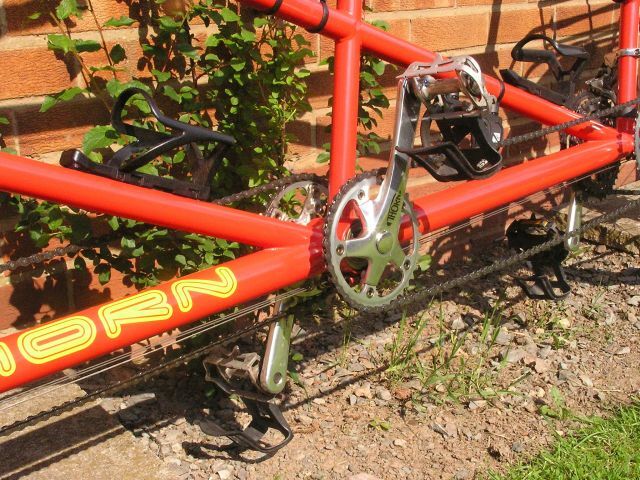 Thorn front crank with crossover drive on the right. Crank length is 175mm. Middle Thorn crank, with the crossover drive for the middle on the left. Crank length is 165mm.